Wallpapering Fog: Google Currents: A new way to read your favourite marketing blog! 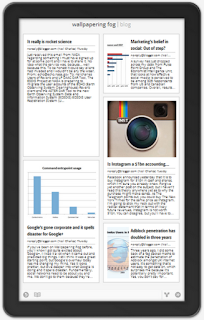 Google Currents: A new way to read your favourite marketing blog! I've just been playing with Google Currents and have got to say, I'm well impressed. On a 7" HTC Flyer tablet, it's slick, easy to read and it looks great. So good in fact, that you can now read Wallpapering Fog there! After you've installed Currents, point your mobile browser here or at the button on the side-bar of this site and you can read Wallpapering Fog in all its tabloidy formatted glory. Apparently I need 200+ subscribers in Currents before I get indexed in the search, so that could be a while... the button's definitely your best bet.